Finger Friendly Scissors are Sharp but Safe, cuts through Paper, Cardboard, Fishing Wire, and Kevlar Fiber! Slice's Ceramic Scissors are next-generation safety tools for adults and children alike. 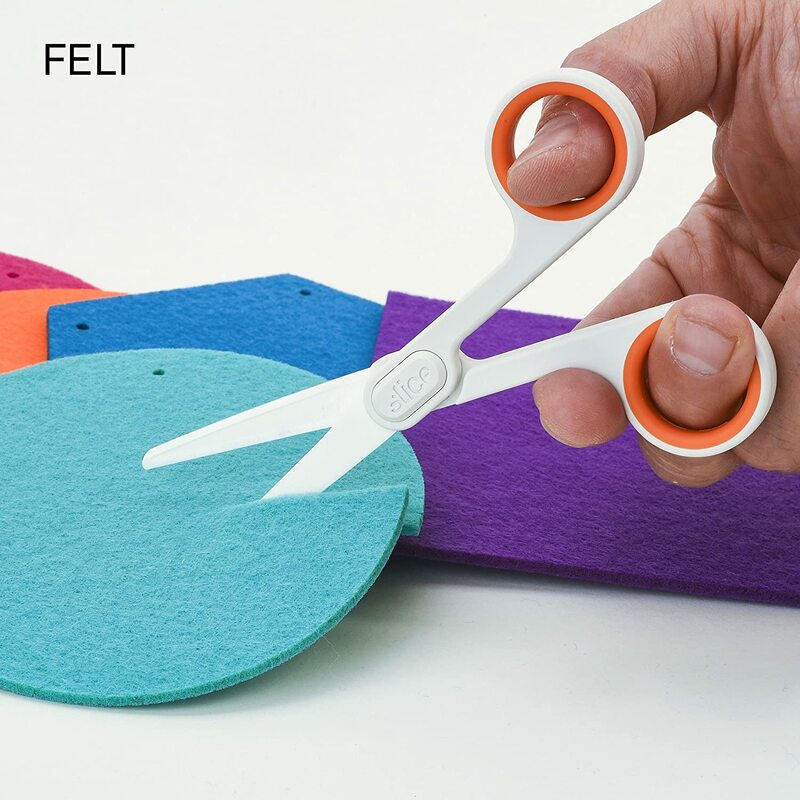 With soft-touch finger grips and an ambidextrous design, these lightweight and compact scissors feature Slice's patented finger-friendly ceramic safety blades. 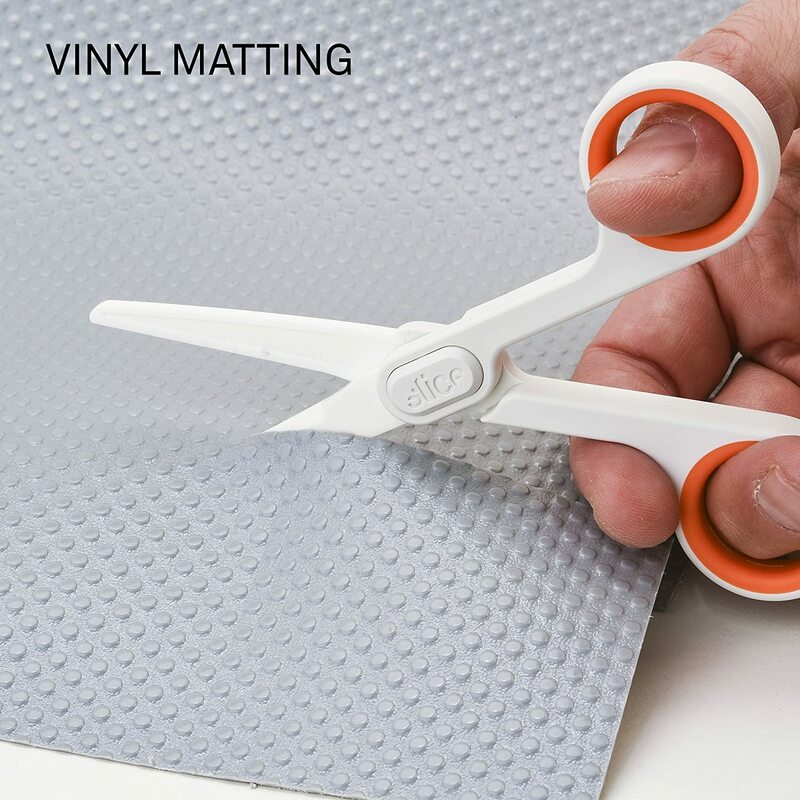 Sharp enough to cut paper and fabric effectively, the Ceramic Scissor blades never rust, are non-magnetic and non-conductive, and stay sharp up to 10x longer than steel. Whether it's to mash baby food or just to avoid metal, Ceramic Scissors are a solid choice in the kitchen. Never rusting blades ensure a clean cooking process. Why do Slice Blades Last So Long? The material Slice uses, zirconium oxide, is much harder than metal and dulls much slower. This means it doesn't require an unsafe initial sharpness. It also means that Slice ceramics last, on average, 11.2 times longer than metal blades. It Never Rusts! Yarn, Cardboard, Fabric, Food, Plastic, Paper, even Kevlar! 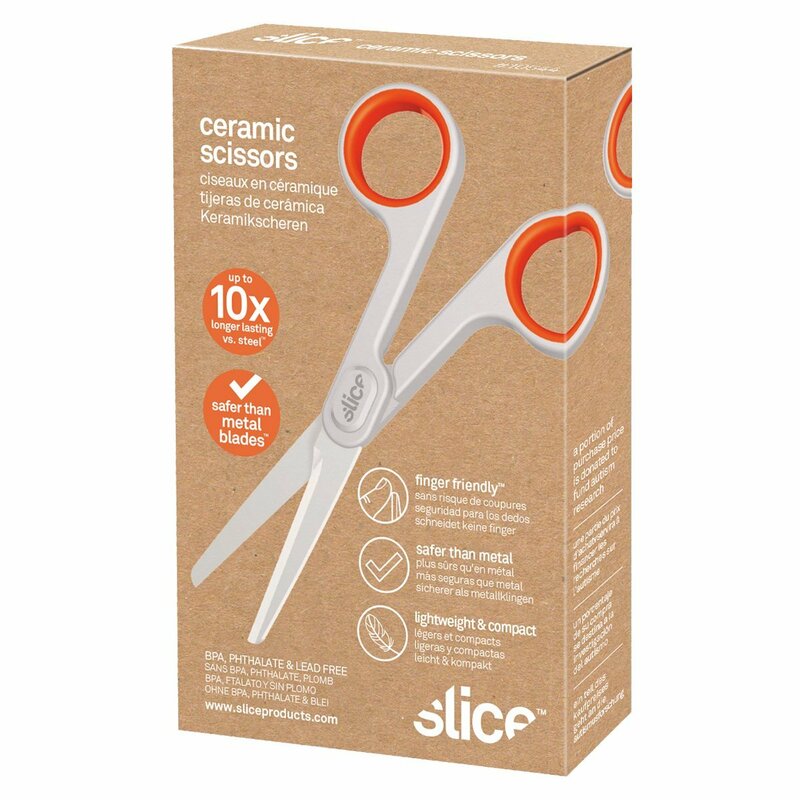 Slice Ceramic Scissors can cut through your everyday and not-everyday items - All without the dangers of metal blades. Ideal for labs, classrooms, scrap-booking, DIY projects, etc. No Pointy Tips and Ceramic Blades means less injuries and no cutting yourself on a blade. Unlike Metal blades, Ceramic blades start off at a safe sharpness and stay there much longer. In fact, a double-edged Slice ceramic blade lasts, on average, 11.2 times longer than its metal counterpart. 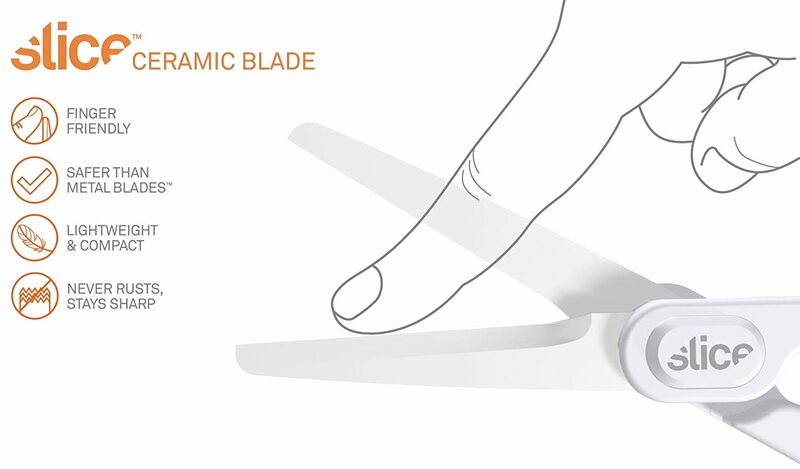 Slice's Ceramic Scissors are next-generation safety tools for adults and children alike. Featuring soft-touch finger grips inside a durable Glass-Filled Nylon handle. Ambidextrous design makes it perfect for all user types. More than half the Fortune-1000 use Slice patented ceramic blade box /& safety cutters as a safer alternative to dangerous metal blades to reduce injuries /& lower costs in manufacturing and operations. Slice has a commitment to donate 1/% of all sales to fund Autism research, primarily through our main benefactor, Lucile Packard Children's Hospital Stanford University. Our proprietary blade manufacturing process combines a unique sharpening angle and thicker ceramic material, resulting in a very unique patented blade that’s safer to the touch vs. metal, and requires pressure to initiate the cut — via our handles. Hence, general blade handling and blade-replacement with Slice ceramic blades is infinitely safer vs. those same activities with traditional metal blades, yet still allows for a wide range of cutting applications. You can’t simply duplicate a metal blade in ceramic material and achieve what we have created with our current products. There’s a tremendous amount of engineering required on not only the blades and handles individually, but there’s also an incredible amount of engineering required on the combination of the handles and the blades working together in order to produce the desired balance of safer-usage and cutting capability. Even today, for our next generation of products that are currently under development, we spend the majority of our time finding the right balance between handle and blade through trial and error and what seems like endless prototypes. The best part definitely has to be seeing peoples first-time reactions when cutting cardboard with Slice and they realize how awesome the Slice ceramic blade is.